Home/Activities in Panama, All/Can you really cycle your way to better Spanish? Well, almost every student I have asked at Casco Antiguo Spanish school gave me a firm: Yes! Whether it was a backpacker studying Small Group Intensive Course or a marketing major enrolled in the Business Spanish course, and everyone in between, the students coming out of the Casco Spanish school agree that getting your blood pumping after a day of class is a great time to put your new language skills into practice. Casco is brimming with great bike rental deals, but you don’t need to worry about that part of this cycle ride, Casco Spanish has your bike rental covered. Students meet as the sun is starting to reach for the horizon at the end of a steamy Thursday. Casco Spanish founder and director David Gold relishes this opportunity to share his love of Panama with those who join him, as he introduces the students to a trusted and reliable bike rental place, providing a great contact for any future cycle needs during your stay in Casco. 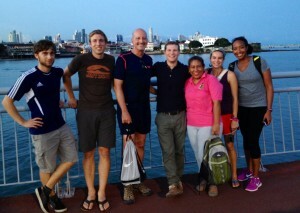 Whether the group hits the Amador Causeway or the Cinta Costera, Gold doesn’t miss an opportunity to bring interesting facts of Panama into the conversation, the Spanish conversation of course, enriching the learning experience with engaging information about Panamanian history and culture. One minute you’re in class, the next minute you’re chatting in Spanish with your classmates as the city fades into the distance, each turn of the wheels taking you closer to an amazing photo opportunity. 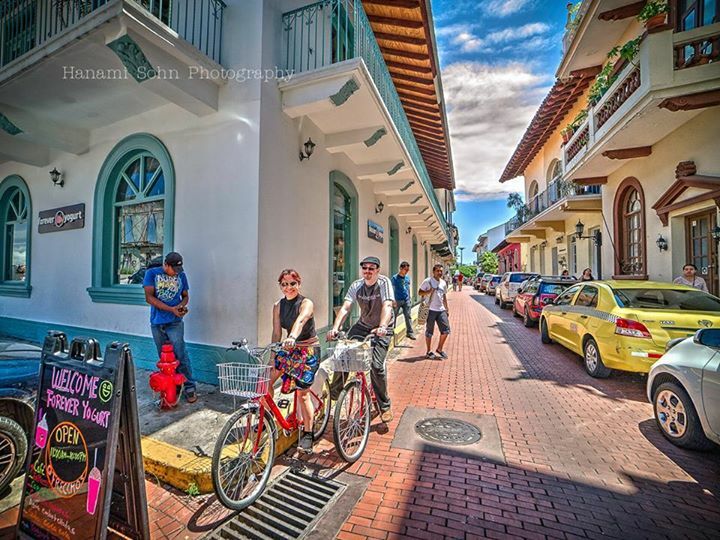 You can capture Panama’s past and future on either of the two afternoon cycle destinations. The Causeway is a 6km road linking three islands, the road itself being built from rock excavated in the construction of the canal and the islands being once home to a US military fort responsible for protecting the entrance to the canal. 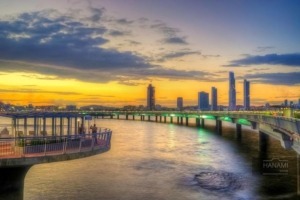 The Cinta Costera runs the entire length of the Bay of Panama, looping around the peninsula of Casco Viejo. Both cycle destinations let you have one foot in the future, one in the past, and cycle away with an amazing selfie with the picturesque city skyline in the background when you’re done. There is something genius about a conversation session on a bike ride. I have a degree in two languages, so it’s safe to say I have sat through many a language-exchange set-up, with mixed results. The genius of the cycle ride is that once the wind whips through your hair, and you have that you-never-forget-how-to-ride-a-bike feeling, language comes more naturally, conversation slides along more easily, and the fact that you are using new and different skills doesn’t seem so awkward or even apparent. Old concepts of sitting still and memorizing for hours are being challenged daily in classrooms around the world where students are being encouraged to move around, helping them to refocus their energies and absorb and retain more information. While teaching theory argues the benefits and questions the shortcomings of education and movement, students from one Central American Spanish school are reaping the benefits of forward thinking. Casco Antiguo Spanish School offers a sunset bike ride every Thursday at 5pm free for all students enrolled the Small Group Intensive Course. For friends and family of students, or those enrolled in Private Spanish Lessons or any other Spanish Course the cost is $4/person for the bike rental. Hi, this is a great concept. I’m not sure I understand your price schedule properly. It’s $229 for 20 hours of class? Yup. Our most popular course, the Small Group Intensive, meets 4 hours/day Monday to Friday for a total of 20 hours. The cost for 1-week is $229. For those who have the time to dedicate to learning learning Spanish we recommend this course. Most people visiting Panama, and those who just arrived to live/work and want to learn a quickly as possible choose this option. We also offer private lessons from $13/hour depending on the number of hour/week and number of weeks you sign up for. Feel free to call (507) 228 3258 or write us at info@cascospanish.com for more info and to schedule a free demo class.